This Anti-livin ELISA kit is a 1.5 hour solid-phase ELISA designed for the quantitative determination of Porcine Anti-livin. This ELISA kit for research use only, not for therapeutic or diagnostic applications! Small volumes of BIRC7 elisa kit vial(s) may occasionally become entrapped in the seal of the product vial during shipment and storage. If necessary, briefly centrifuge the vial on a tabletop centrifuge to dislodge any liquid in the container`s cap. Certain products may require to ship with dry ice and additional dry ice fee may apply. MBS741171 is a ready-to-use microwell, strip plate ELISA (enzyme-linked immunosorbent assay) Kit for analyzing the presence of the Anti-livin antibody (BIRC7) ELISA Kit target analytes in biological samples. The concentration gradients of the kit standards or positive controls render a theoretical kit detection range in biological research samples containing BIRC7. The ELISA analytical biochemical technique of the MBS741171 kit is based on BIRC7 antibody-BIRC7 antigen interactions (immunosorbency) and an HRP colorimetric detection system to detect BIRC7 antigen targets in samples. The ELISA Kit is designed to detect native, not recombinant, BIRC7. Appropriate sample types may include undiluted body fluids and/or tissue homogenates, secretions. Quality control assays assessing reproducibility identified the intra-assay CV (%) and inter-assay CV(%). Principle of the Assay: Anti-livin ELISA kit applies the competitive enzyme immunoassay technique utilizing Anti-livin antigen (Anti-livin) and an Anti-livin-HRP conjugate. The assay sample and buffer are incubated together with Anti-livin-HRP conjugate in pre-coated plate for one hour. After the incubation period, the wells are decanted and washed five times. The wells are then incubated with a substrate for HRP enzyme. The product of the enzyme-substrate reaction forms a blue colored complex. Finally, a stop solution is added to stop the reaction, which will then turn the solution yellow. The intensity of color is measured spectrophotometrically at 450nm in a microplate reader. The intensity of the color is inversely proportional to the Anti-livin concentration since Anti-livin from samples and Anti-livin-HRP conjugate compete for the Anti-livin antigen binding site. Since the number of sites is limited, as more sites are occupied by Anti-livin from the sample, fewer sites are left to bind Anti-livin-HRP conjugate. A standard curve is plotted relating the intensity of the color (O.D.) to the concentration of standards. 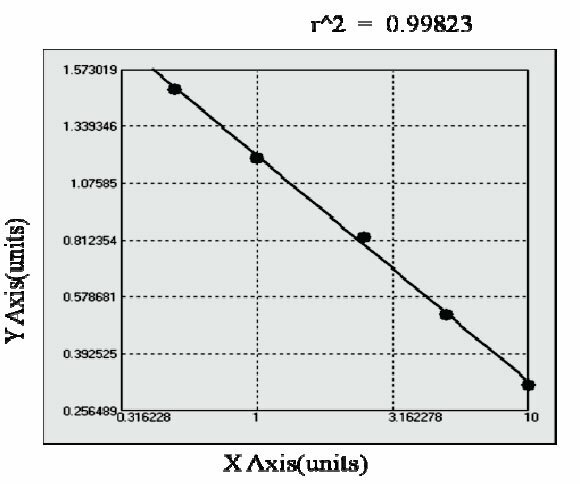 The Anti-livin concentration in each sample is interpolated from this standard curve. NCBI/Uniprot data below describe general gene information for BIRC7. It may not necessarily be applicable to this product. BIRC7: Apoptotic regulator capable of exerting proapoptotic and anti-apoptotic activities and plays crucial roles in apoptosis, cell proliferation, and cell cycle control. Its anti-apoptotic activity is mediated through the inhibition of CASP3, CASP7 and CASP9, as well as by its E3 ubiquitin-protein ligase activity. As it is a weak caspase inhibitor, its anti-apoptotic activity is thought to be due to its ability to ubiquitinate DIABLO/SMAC targeting it for degradation thereby promoting cell survival. May contribute to caspase inhibition, by blocking the ability of DIABLO/SMAC to disrupt XIAP/BIRC4-caspase interactions. Protects against apoptosis induced by TNF or by chemical agents such as adriamycin, etoposide or staurosporine. Suppression of apoptosis is mediated by activation of MAPK8/JNK1, and possibly also of MAPK9/JNK2. This activation depends on TAB1 and NR2C2/TAK1. In vitro, inhibits CASP3 and proteolytic activation of pro-CASP9. Isoform 1 blocks staurosporine-induced apoptosis. Isoform 2 blocks etoposide-induced apoptosis. Isoform 2 protects against natural killer (NK) cell killing whereas isoform 1 augments killing. Binds to CASP9. Interaction with DIABLO/SMAC via the BIR domain disrupts binding to CASP9 and apoptotic suppressor activity. Interacts with TAB1. In vitro, interacts with CASP3 and CASP7 via its BIR domain. Isoform 1 and isoform 2 are expressed at very low levels or not detectable in most adult tissues. Detected in adult heart, placenta, lung, lymph node, spleen and ovary, and in several carcinoma cell lines. Isoform 2 is detected in fetal kidney, heart and spleen, and at lower levels in adult brain, skeletal muscle and peripheral blood leukocytes. Belongs to the IAP family. 2 isoforms of the human protein are produced by alternative splicing. 1. Livin expression was not associated with survival in pancreas ductal adenocarcinoma.